Hip-hop musical Hamilton could set a new record when it rocks up at the Olivier Awards on Sunday night. It already goes into the biggest night in the UK theatrical calendar with a record-breaking 13 nominations.Harry Potter and the Cursed Child won nine awards last year, setting a new record for the most Oliviers ever received. The most Olivier Awards received by a musical to date is seven, a record set by Matilda in 2012. 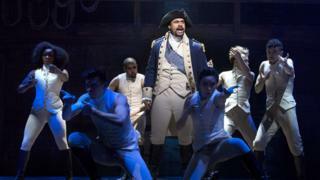 Two of Hamilton's nominations are in the best actor in a musical category, which sees Giles Terera and Jamael Westman recognised. The musical, written by Lin-Manuel Miranda, fuses rap and hip-hop to tell the story of American founding father Alexander Hamilton, played by Jamael Westman in London.Terera plays Hamilton's nemesis Aaron Burr in the show, which opened in London last year after enjoying huge success in New York.Three of the show's Olivier nominations come in the same category - best supporting actor in a musical - meaning that the most awards it can actually win is 10. Stephen Sondheim's Follies, performed at the National Theatre, has 10 nominations. These include two nods in the best actress in a musical category, where Imelda Staunton and Janie Dee go head to head.Four-time Olivier winner Staunton gets another nomination in the best actress category for her role in Who's Afraid Of Virginia WoolfFollow us on Facebook, on Twitter @BBCNewsEnts, or on Instagram at bbcnewsents. If you have a story suggestion email entertainment.news@bbc.co.uk.